If your computer refuses to boot or load Windows, or if you are trying to restore an image to a partition that Reflect cannot lock (such as your Windows system drive), then you will have to start your PC using a rescue CD or boot into the Macrium Rescue environment. For the professional and server editions, you have the option of restoring to a new system or virtual machine, employing the redeploy feature to reconfigure your windows installation for the new hardware. You have a number of options, each with their own advantages. The aim of this article is to help you understand which one is the best choice for you. Linux is a free, open source UNIX based operating system, with wide hardware support. Windows PE is a reduced version of windows designed to boot off CD/DVD media on the widest range of hardware. Macrium v5 enables either PE3.1, PE4 and PE 5, based on the Windows 7 Service Pack 1, Windows 8 and Windows 8.1 kernels respectively. Note: Historically, PE was prebuilt by Macrium. However, due to a global licensing change, the PE components are now downloaded from Microsoft and the rescue environment is built locally. This is an automated process, running as required by the rescue media wizard. You have the choice of PE3.1, PE4 and PE5 defaulting to PE3.1 unless you are running Windows 8/Windows 8.1 in which case the default is PE5. We suggest you stick with the defaults unless you have good reason not to. Just as for your normal windows installation, the rescue environment needs to include support for your hardware, in particular mass storage (inc. RAID if applicable), USB and network interfaces. The Linux environment supports most common hardware interfaces, including support for the most widely used RAID systems and USB3 connected devices. It cannot be customised for unsupported hardware. The Windows PE environment supports more hardware out of the box. Additionally, support can be added for devices that don't have default drivers. When a rescue CD is created, your system hardware will be analysed. Drivers for unsupported devices will be located on your system or via any driver disks supplied and added to the Windows PE environment. A limitation is that support cannot be added for the booting media. For example, if your CD drive is connected via an unsupported SCSI interface or your boot menu lies on a similarly unsupported RAID array, it will not boot. Booting using a USB stick is a good workaround in this case as all USB 2 interfaces are supported by default. Note: You can overcome this issue using solution 2 of this article. The Linux environment can only be booted off CD & DVD media. Windows PE will boot off CD & DVD media and also USB sticks / thumb drives and USB attached external hard disks. Furthermore, Windows PE can be added as a boot menu item. The main purpose of this is for convenience and for automated restores to your system disk. It should not be relied upon as a rescue mechanism as you may loose the boot menu in the case of hard disk failure or corruption. The Linux rescue environment is extremely compact (circa 20 MB). The windows PE environment is a rather larger at about ~180MB. The Linux CD boots straight into a restore wizard and only offers basic restore functions. The Windows PE user interface is identical to that of the main application and offers the same core functions. The Linux and custom Windows PE systems are available on all installation types. The Linux CD is included in the installer, while the custom PE system requires a download from Microsoft. Note that redeploy is not available in a trial install. *** Dependent on PE version and architecture. PE4 and 64bit PE types are larger than PE3 and 32bit types. Once I have created a rescue CD, will it work on all my computers? If you are using the Linux CD, the answer is yes. For Windows PE, the answer is more complex. If the hardware for all your computers is supported by the default windows PE driver set, then the answer again is a simple yes. You can confirm this on the Rescue Media Wizard drivers page - if all the drivers listed have the status "Device support in WinPE" or "Compatible device support in WinPE" for each of your machines then you only need one CD. If any of your machines require extra drivers, then you have three options. 1) Create one CD per machine. 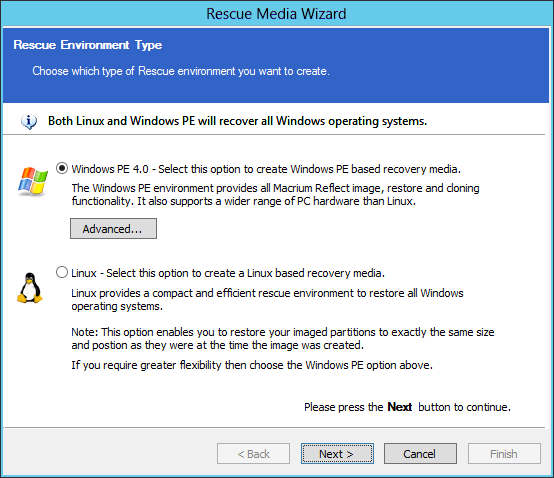 2) Invoke the create Rescue media wizard on each of your machine, ensuring that all the necessary drivers have been located and you progress to the Rescue media burn page. Then copy the contents of c:\boot\macrium\drives on each machine to one machine. Finally, burn a Rescue CD on that machine. 3) Using the Rescue media wizard create a bootable USB stick, inserting the same device on each machine in turn. Options 2 & 3 will only work if all your machines are configured to use the same version of PE with the same architecture (i.e. they are all 32bit or all 64bit). Have you changed your BIOS settings to boot from CD/USB before your hard drive? Accessing the BIOS varies from PC to PC but you will always see a brief message that tells you how to do this as the PC is starting. Power on your PC from a full shutdown (not hibernate) and watch the screen carefully. Look for a line of text that says something like, 'Hit Del to enter setup' or 'Press F2 for BIOS settings'.Once you've found the correct key (generally, Del, or one of the function keys such as F2, F10, F11 or some other key such as ESC), press it repeatedly until you see a BIOS setup screen. There are many articles already on the internet about setting your BIOS to boot from CD/DVD or USB (USB is often called 'removable device' or 'USB-HDD' or 'USB zip disk' or something similar): You can find pictures of BIOS setup screens on a number of websites if you do not have your motherboard manual. (Note that some old PCs may not be able to boot from USB but only CD/DVD). Once you've changed the BIOS settings correctly, your PC should load Windows PE or Linux quickly. You may though see on the screen something like the following line: Press any key to boot from CD or DVD in which case press any key on the keyboard to boot from CD/DVD otherwise your CD/DVD will not boot. There is a YouTube video on how to create a rescue CD in Windows 7 using the WAIK. Article has been viewed 61,507 times.